Kendal Thompson was one of the nation's top 20 quarterbacks in the 2011 recruiting class. 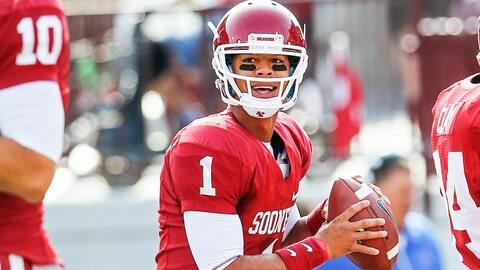 Oklahoma will be down a quarterback for the 2014 season. Sophomore Kendal Thompson, the son of former Oklahoma quarterback Charles Thompson, plans to graduate in May and transfer. Thompson announced the news via his Twitter account on Tuesday night. Thompson appeared against Iowa State and Oklahoma State this season, completing 4-of-13 passes for 64 yards, a touchdown and an interception. He also rushed four times for 20 yards. Thompson was one of the nation’s top 20 quarterbacks in the 2011 recruiting class and the No. 2 player in Oklahoma when he signed with the Sooners and was named an Under Armour All-American. The 6-foot-1, 199-pounder is a native of Southmoore, Okla.
Sophomore Trevor Knight is expected to start the 2014 season after throwing four touchdown passes in the Sooners’ Sugar Bowl victory over Alabama. Senior Blake Bell also started eight games in 2013. Oklahoma signed Colleyville, Texas native Cody Thomas in 2013 and has Edmond, Okla. native Justice Hansen committed for the 2014 class.